Figure 9.2. Journey time as a function of spacecraft speed. reach the nearest star in our current projection of future systems for this century. However, are there possibilities, or potentials? It is well known that enormous amounts of rocket propellant are required to overcome gravitational and inertial resistance to Earth-to-orbit flight. Here, overcoming gravitational and inertial resistance to upward and forward flight requires imparta-tion of about 7.5km/s velocity to Earth-to-orbit rocket ships, and this requires that about 90 percent of single-stage-to-orbit (SSTO) rocket ship weight be propellant. 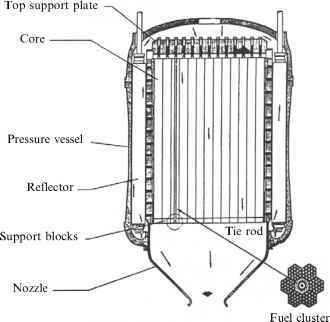 Thus, if field actions and reactions of field propulsion could significantly reduce gravitational and inertial resistance, rocket thrust and propellant needs would be significantly reduced. But a major obstacle to reducing such resistance by field propulsion is current lack of understanding as to the origins of gravitation and inertia—of why and how they instantly arise to resist vehicle acceleration (or deceleration) and the vehicle's upward flight. Although the relation of gravity and inertia to parameters such as motions, distances, and ponderosities of material bodies are well known, there is no consensus whatsoever as to the origins of gravity and inertia. Froning [Froning, 2004] discusses three possible origins of mass and three possible origins of inertia; however, none of the six possibilities have been confirmed, as we began this chapter. So, until quantum physics can change the situation, we are confined, optimistically, to about 10 light-years from our Sun, but the speed at which we can reach destinations within this sphere is wholly dependent on the specific impulse of the propulsion systems we can create. Today we are limited to the leading edge of the Oort Cloud. If practical fusion rockets are a reality we could probably get a little farther, but to reach the trailing edge of the Oort Cloud we need a factor of 10 increase in specific impulse. 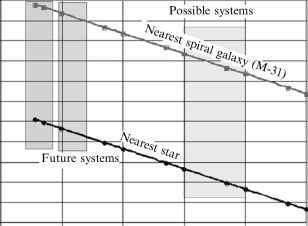 To reach 10 light-years requires a 10,000fold increase in specific impulse. Thus what we need to do now is concentrate on getting from the surface of the Earth to orbit and to maneuver efficiently while in orbit, so when these far-in-the-future propulsion advances are made, we will have the Earth-orbit-moon infrastructure to take advantage of these developments.